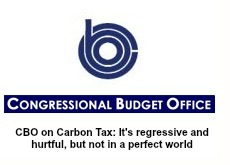 The Congressional Budget Office this week released a study on the “Effects of a Carbon Tax on the Economy and the Environment.” CBO admits that a carbon tax would raise the costs of producing goods and services and raise consumer prices. On the other hand, some of the negative effects could be offset by using the revenues generated to lower the federal deficit and to lower marginal rates of other damaging taxes, such as corporate and individual income taxes. Professor Robert Murphy commented on the CBO study for the Institute for Energy Research here, and Dr. David Kreutzer of the Heritage Foundation posted his comment here. Another contribution to the carbon tax debate from earlier in the month has just come to my attention. On 2nd May, fifty-four trade groups sent a letter to the chairmen and ranking members of the House Ways and Means Committee and the Senate Finance Committee explaining why they are opposed to a carbon tax. Attached to their letter is a study produced by NERA Consulting earlier this year for the National Association of Manufacturers that details the negative economic effects of a carbon tax. Next post: Q. What Do Rich States Have in Common?